Consuelo's Mexican Bistro: Breakfast hours are Saturday + Sunday from 9:30am-3:00pm, Click Here to view the menu! Left Bank Brasserie: Enjoy a Fun and French Weekend Brunch on Saturdays from 11 AM to 2:30 PM, and Sundays from 10:30 AM to 2:30 PM. To make a reservation, please call 408.984.3500. View the full Brunch Menu! LB Steak: Opens at 11 a.m., serving morning favorites such as Steak and Eggs and French toast. The highlight is a Land and Sea Bloody Mary with a slider, prawn, and pickles! To make a reservation call 408.244.1180. Or click here for the full menu. Village California Bistro: Opens at 8:30 a.m. on Saturday and Sunday only, and 10am on weekdays. Nibble on brioche french toast, bistro eggs benedict, or a breakfast prix fixe menu for $20! Breakfast avaliable EVERYDAY. To make a reservation call 408.248.9091. Click here for menu. Rosie McCanns Irish Pub & Restaurant : Opens at 9:30 a.m., Click here to view the menu.For reservations call 408.247.1706. Straits Restuarant: The Weekend Brunch Menu is served Saturday & Sunday from 11am-3pm. For more details call, 408.246.6320. Tacolicious: 11:30am-3pm Saturday and Sunday, Click here to view menu! 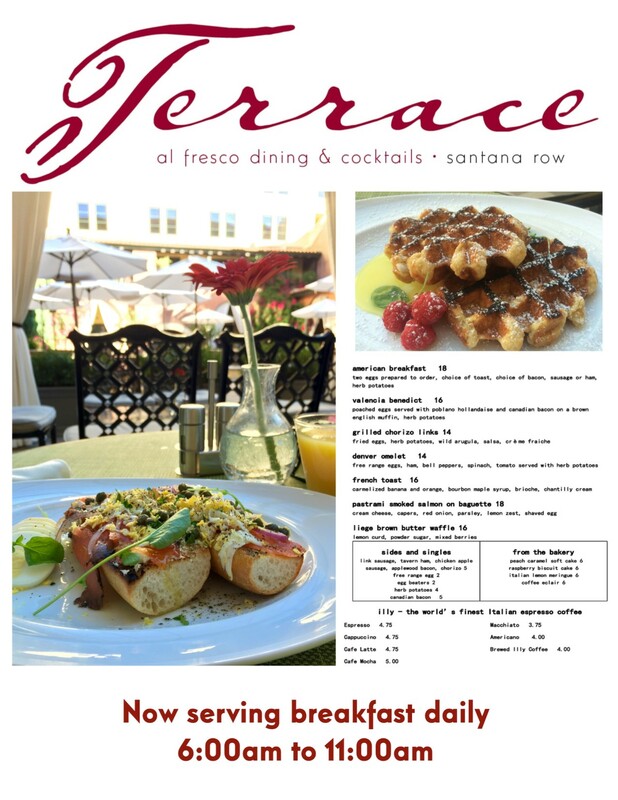 Terrace at Hotel Valencia: Breakfast is served daily from 6am to 11am. Click here for more details. Cocola Bakery: Opens at 8 a.m., serving fresh pastries, coffee, tea and more! Starbucks: Opens at 5:30 a.m., serving coffee, tea, breakfast sandwiches, pastries and more! Peet’s Coffee: Opens at 5 a.m., serving specialty coffee, tea and pastries. For more information please contact the Santana Row Concierge at 408.551.4611.